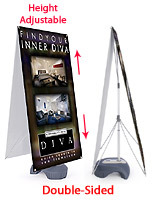 These outdoor banner stands are a great way to promote your advertisements and promotional events. Outdoor banners feature a durable metal stand and a heavy-duty water base. The frame can be assembled by connecting the aluminum pole and the plastic water base. 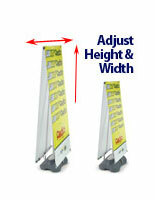 We recommend filling the plastic base with either water or sand to ensure the stability of the outdoor banners. Featuring a unique "A" frame style design, these outdoor banners can easily complement any setting they are placed in. Occupying only a small footprint, these outdoor banners can catch attention even from across a crowded convention hall. 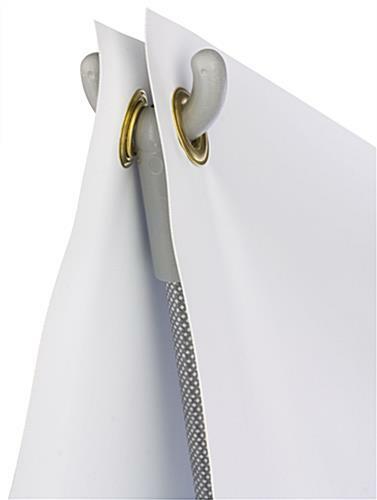 Outdoor banner stands can be easily attached by simply sliding the grommets over the hooks. However, we do not include graphics with these outdoor banners. 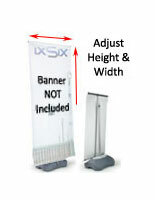 However, if you wish to purchase the banner stands with graphics, see the related products. The outdoor banners can be used over and over again, and they are definitely great for use in trade shows, at special events, conventions and for exhibition use. With these outdoor banners, you can change your banners frequently without the need of buying a new stand. 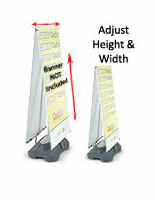 Please Note: Although this banner stand is designed to be used outdoors, we strongly recommend customers bring the banner stand indoors during inclement weather such as rain, snow and windy conditions. 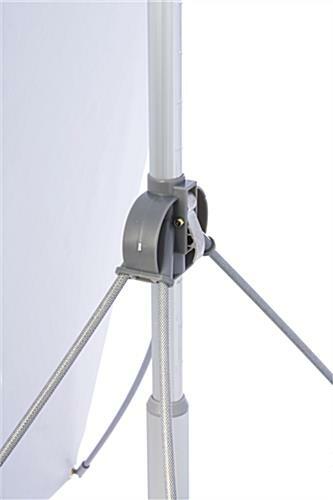 This will protect the stand from being blown away or broken. This banner stand does not include a printed banner. 33.5" x 9.0" x 28.0"
14.0" x 8.0" x 19.8"